Epigentek Group Inc. is the leading developer and provider of innovative technologies and products for epigenetic-related research. The company has developed a compre- hensive portfolio of more than 400 proprietary products to provide complete and systematic solutions for epigenetics-related research and drug discovery. Epigentek products are used all around the world by esteemed academia, leading pharmaceuticals, and cutting-edge biotechnology companies. These unique products are specifically designed to make assays much simpler, faster, more convenient, and highly more efficient than currently used methods. 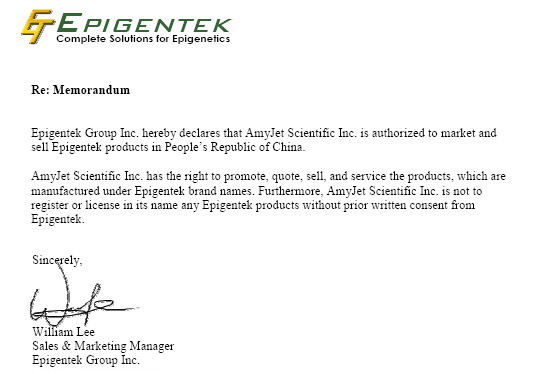 Epigentek's products are sold through a dedicated sales force and a global network of distributors in more than thirty six countries and regions. It is our number one priority to ensure that the innovation of our technology will result in complete customer satisfaction and the greatest success in your experiments. The company, particularly emphasizing speed and effectiveness in its technologies, continues to focus on epigenetic innovation and extensively develop and enhance its product portfolio.